Gimbap always takes me to a happy place. It’s no wonder. 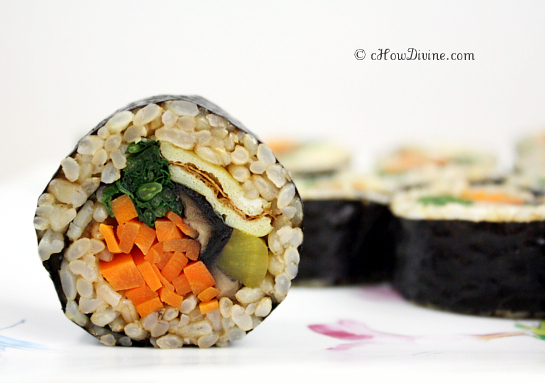 Gimbap is commonly consumed at picnics. And understandably, it conjures up warm weather, fresh-cut grass, and fun. It makes sense since it’s very much an on-the-go food. Everything is wrapped in a neat package that can be easily be popped in your mouth. They are delicious and flavorful just the way there are. No need for sauce. No mess. No fuss. So my mom ALWAYS made sure I had plenty whenever I went on a school field trip or a picnic. Thanks mom! Traditionally, gimbap is made of marinated beef, spinach, carrots, takuan or danmuji (pickled radish), eggs, and steamed rice. But you can make it with just about any protein and/or vegetables. And many gimbap rolls are made with fish cakes or imitation crab in lieu of beef. 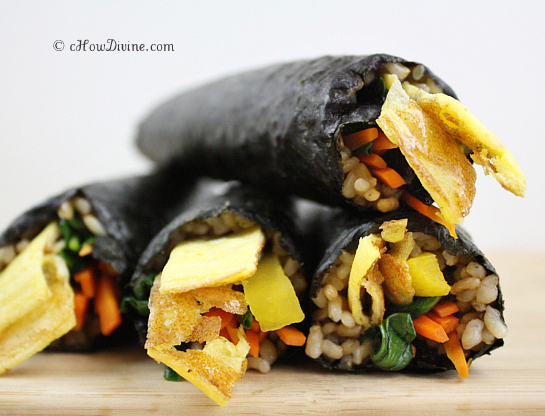 You can make the gimbap as healthy or as naughty as you want. I decided to make the healthy “superfood” type that tasted naughty – with kale, mushrooms, carrots, pickled radish, eggs, and short-grain brown rice. And of course, all of that goodness is wrapped in another superfood that usually tops many lists of superfoods, dried sea vegetable (laver). Whenever I make gimbap, I remember why I love it so much. It so delicious. And it’s so fun to eat. It takes me right back to my childhood picnics. Sauté carrots until crisp tender. Add a pinch of salt and mix well. Set aside. Sauté kale until it just wilts. Add a tablespoon or two of water to speed up the process. Add a pinch of salt and mix well. Set aside. Sauté mushrooms until lightly browned. Add a pinch of salt, teaspoon of tamari, and teaspoon of agave nectar. Mix well. Remove from heat once all of the liquid has been absorbed. Set aside. Add a pinch of salt and pepper to the beaten eggs. Pour the eggs into a heated, well-oiled pan. Pan fry in the shape of a pancake/omelette. Remove from heat and cut into 1/2-3/4 inch strips. Spread out the rice in a thin layer to let it cool until it’s comfortable to touch. Once cooled, mix the rice and the rest of the ingredients for the gimbap rice in a bowl. Mix gently being careful not to crush the rice. Place a piece of dried laver on a bamboo mat. Spread out 1 cup of the gimbap rice over 3/4 of the laver, leaving the 1/4 of the laver farthest from you empty. 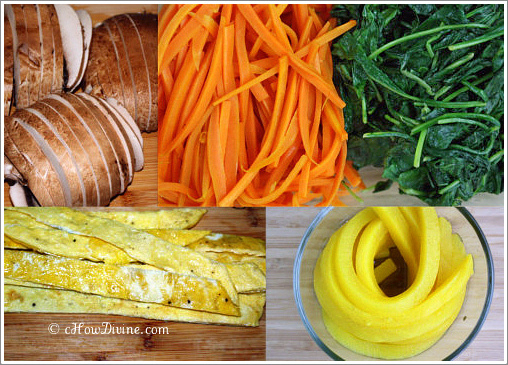 Place a layer of carrots, kale, mushroom, pickled radish, and a strip (or two) of eggs on the rice. Try to stack the filling ingredients on top of one another. Roll away from you by pulling up on the edge of the bamboo mat closest to you, and folding the rice and laver over the filling. Squeeze and roll again creating a nice round cylinder, peeling back the bamboo mat as you roll. Roll tightly. It’s kind of like rolling a cigar (well, not as tightly). Repeat with rest of the rice and laver. Cut the gimbap into 1/2-3/4 inch pieces with a sharp knife. Wipe the knife as necessary with a paper towel soaked in some oil. Serve on a plate or in a bento box. Enjoy your gimbap! You will have some filling ingredients left over. If you do, make some bibimbap or bibim guksu with them with some gochujang sauce. 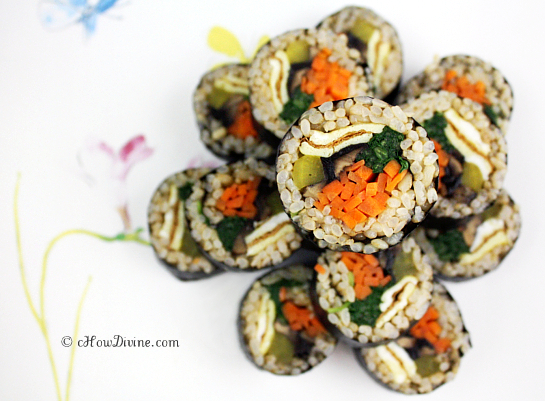 *Cook’s Note: When making gimbap, make sure the rice you are using is short grain. Short-grain rice is stickier which is necessary for the sushi to keep its shape. Some markets carry “sushi rice,” which is just short-grain, white rice. If in doubt, “sushi rice” is a safe way to go. And you can use as much or as little vegetable fillings as you want. It’s up to you. However, if you are a novice at this, it will be easier to roll with less filling. Additionally, if you want to make it vegan, just omit the egg or substitute it with avocado slices. My mom always adds sugar-soy braised gobo root. So yummy! I couldn’t find any at my local grocers tho. I love gimbap (well, I suppose I love sushi, and I love gimbap by extension)! It’s so hard to come by vegetarian rice rolls that aren’t insanely overpriced in restaurants, so I’m a huge fan of making these at home as well. Thanks so much for sharing! 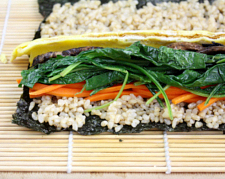 My kids love seaweed, toasted or not, and especially when wrapped with rice! I’d like to make this gimbap recipe for them. would you please share how you cooked the brown rice? I usually germinate my brown rice. It’s not as difficult as it sounds – just soak it in water. But of course, you don’t need to do that. I do, however, always use short-grain brown rice and brown sweet rice (3 cups short-grain and 1 cup sweet). I do this because they give the texture closest to “Korean Rice” – meaning they stick together. When I do cook it, I almost always use my rice cooker. But when I don’t, I use a pressure cooker. Using a regular pot works, but the texture is just not there. I usually do 2:1 water to brown rice ratio when I use the pressure cooker; this is with NO soaking at all. If you do soak, you will have to take into account the water that’s been absorbed by the rice.